When you live and work in Georgia, you know that small businesses are the backbone of every town. At Jimmy Britt Chrysler Dodge Jeep Ram, we're thankful for the small businesses that operate in the Central Georgia region. We know how important these companies are to the community, which is why we help small-business owners build and maintain a strong Ram commercial fleet. Whether your industry calls for a new Ram 2500 or 3500 truck, or a new Ram ProMaster van, the team at our Ram dealership near Warner Robins, GA, will help you buy or lease a commercial Ram truck or van for your lifestyle and needs. Visit us to buy a new Ram 1500 pickup or to lease a Ram Chassis truck today! Our Georgia Ram commercial dealer wants you and your business to feel supported. 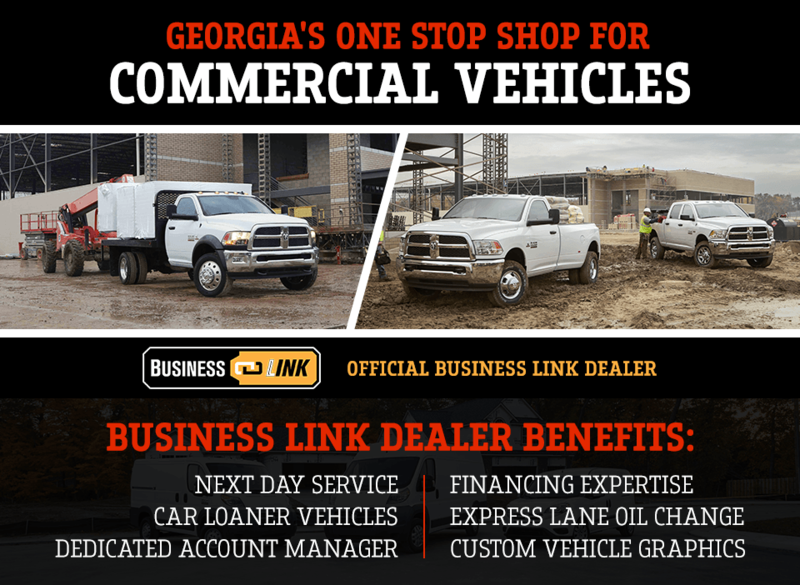 That's why when you buy or lease a Ram commercial truck or van from us, you'll be enrolled in our free BusinessLink program. This program grants you access to next-bay service, extended service hours, loaner vehicles and more. You'll also receive Ram On The Job™ upfit and equipment allowances to help you save when buying new Ram commercial vehicles. Our Ram commercial financing team strives for 100% credit approval, and our Ram commercial service center is open six days a week to make your commercial Ram sales and service convenient. If you want to power your business with a reliable fleet of Ram commercial vehicles, call our Ram commercial center at (478) 246-0186, or get directions to Jimmy Britt Chrysler Dodge Jeep Ram. Visit us today and improve your business!